Itajai - American team PUMA snatched the lead in Leg 6 of the Volvo Ocean Race on Wednesday as the fleet prepared for 24 hours that could prove crucial in the race to the Miami finish line. The five crews were facing an area of changeable breeze that was blocking their path to the stronger, more consistent South Atlantic trade winds that once into will catapult them north at top speed. Puma overhauled leaders Camper, a Kiwi/Spanish syndicate, and second-placed Emirati entry Abu Dhabi after the front pair faltered in light winds closer to the coast of Brazil. "Today's the big day," said Puma navigator Tom Addis. "The first boat into the trades has a pretty major advantage - you can extend for quite a long time and be quite hard to catch. "This is the critical moment. Some points on some race tracks aren't critical but this one is critical." Despite their positions in fourth and fifth respectively, overall race leaders Telefonica of Spain and French team Groupama were poised to pounce on their rivals if they find more wind off shore. 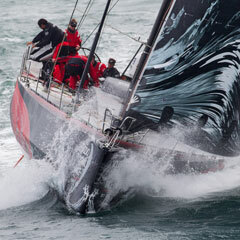 "It's a bit like the Doldrums," Groupama navigator Jean-Luc Nelias said of the tricky weather system lying ahead. "It's so hazardous and complicated that it's not always the first to enter who leaves first." The teams should arrive in Miami at the end of Leg 6 around May 7, with the 39,000-mile round the world race finishing in Galway in July.